In a letter to RTA's board of trustees, Clevelanders for Public Transit's Chris Stocking, Cleveland City Council's Kerry McCormack and Cuyahoga County Council's Dale Miller have asked for an open and transparent process in hiring the agency's next CEO. The letter, which outlined desired qualifications for the candidate ultimately selected, is being delivered at Tuesday morning's board meeting. "This is a chance to develop and execute a holistic, positive vision for GCRTA and to highlight the ability of transit to make a positive contribution to our region," the letter said. 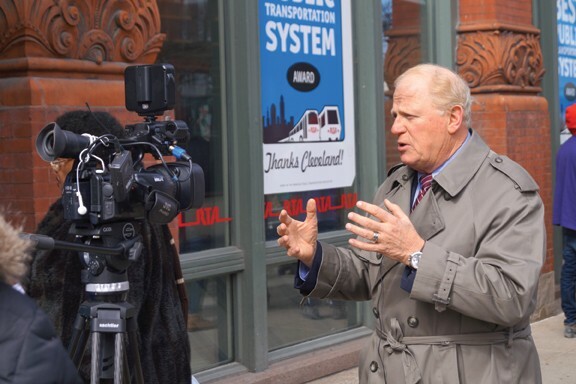 "Under the right leadership, we believe GCRTA will improve the physical and social mobility of thousands and ultimately the economic, social and environmental health of Cuyahoga County." As in prior appeals — e.g., the recurring call to both Armond Budish and Frank Jackson to appoint transit riders to the board — this one reflects the hope that those who use the system, riders themselves, will factor into the process. The letter calls for a CEO who is willing to "elevate community voices" in decision-making and asks that final candidates participate in a community forum. Among other desired qualifications for the CEO, the letter asks for a person who intends to make equity a "guiding principle" in transit planning, and one who — this may sound shocking — views public transit as a public good, "not a profit-driven business." The letter asks, additionally, that the CEO, General Manager and Secretary/Treasurer positions, which had all been performed by former CEO Joe Calabrese, be separated to improve accountability and job performance. Calabrese waded too deeply into hot water this summer after ongoing communication issues with the board and a suspicion that he'd been complicit in a years-long health insurance scandal which led to the resignation of former board chair George Dixon III and the dismissal of HR Director Bruce Hampton. Calabrese was gently and strategically booted from the top spot this summer. Dr. Floun'say Caver is currently serving as interim CEO.